At 6:30 the alarm sounded and we woke up in our tents outside Comyns Hut, immediately feeling how cold it had gotten overnight in the wide high tussocked valley. Shep and Thomas had slept inside the hut so Jasper went in to wake them. We packed up our tents with freezing hands, numbed by the just-above-freezing condensation on the inside of the fly. Though we tried to pack up sort of quickly to try to get warm, we didn’t leave until about 7:15 just because a group of six is unavoidably going to be slightly slower – but to our surprise we were still the first party to leave. Right off the bat we were greeted by the rushing freezing stream we would be walking up for the next 3 kilometers, taking a turn out of the valley we spent the night in and into the smaller and steeper valley of the North Branch Ashburton River. 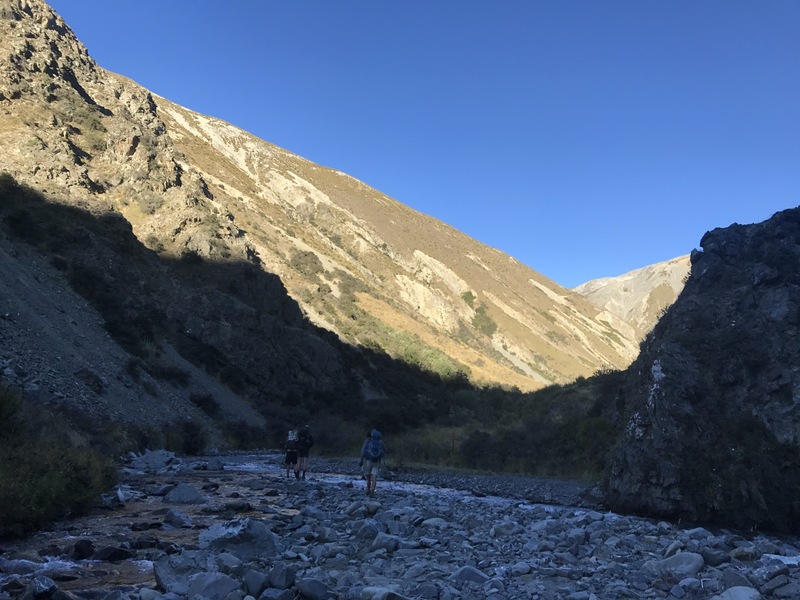 There was no way to avoid wet feet on the first crossing, but we soon learned that we would basically be traveling up the stream bed itself, so there would be no point in even trying to stay dry. Up we charged, through the swift but thankfully never above mid-thigh-deep water. The water was not quite as cold as the water the morning of Waiau Pass but we were in it for so much longer that it was all in all a much colder experience. 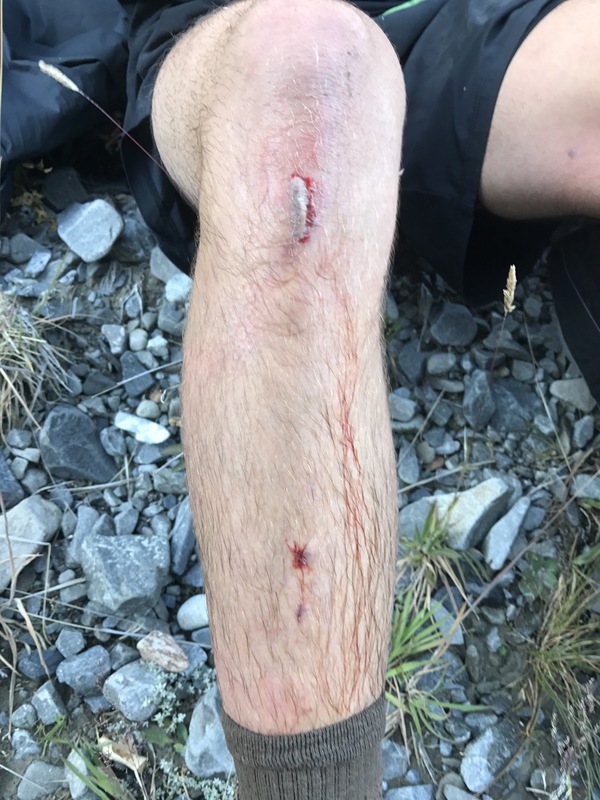 We had tromped up the stream in and out of the water from bank to bank for not fifteen or twenty minutes, all in terrible moods and much pain, before Shepard stopped us to deal with an inch-and-a-half long gash on his shin from falling on a sharp rock. At this point couple who stayed in the hut the night before passed us, a guy named Heartbreaker who had a Pacific Crest Trail tattoo on his calf and an Italian girl named Victoria who appeared to be hiking together. When we had taken care of the injury we moved on and finished the three km in this river valley before turning to the left up the Round Hill Stream. This one was slightly smaller so there started to be more and more time on the banks and less in the water. For the whole morning so far we had been in complete shade given the steepness and angle of the valley but this valley was angled more east-west, so that we could see the rising sun illuminating the walls ahead of us. We chased and chased the sun until finally coming upon an open spot where it was just starting to reach the floor. We basked for a bit but it was unfortunately too weak to really warm us and we were warmer moving. So we kept on climbing as the sun grew stronger and began to make our feet less numb between crossings. 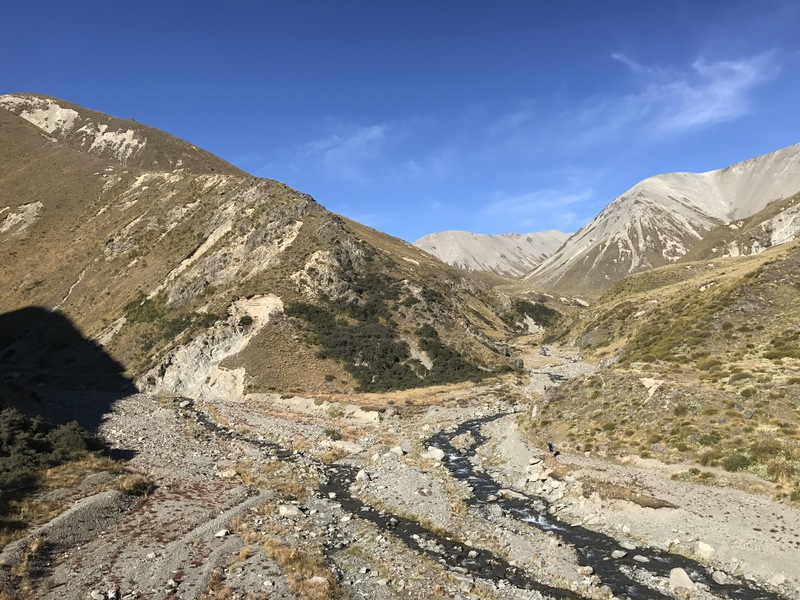 Eventually, after an hour or two of terrible cold wet splashing, the sun was warm enough to be hot and the stream was small enough and the valley was shallow enough that we sidled through tussock above it instead of in it. When we finally got within a kilometer of Clent Hills Saddle the stream was too small to have an actual bed and instead trickled underneath the ground, creating a terrible walking situation where any step could be two feet deep if one wasn’t careful. Once there was no more stream to follow we diverted up a slope to the final and steepest climb to the saddle, the highest point of the day. 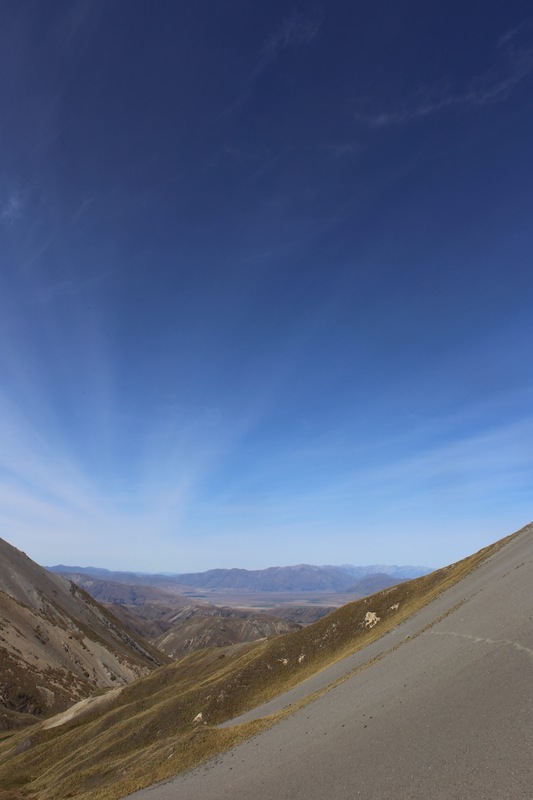 We spent ten minutes or so and snacked on top of the saddle, looking out over the high flat country far ahead of us (later in the day), the close mountains surrounding us, and the wide scree slope right in front of us, with a clear thin path traversing it. 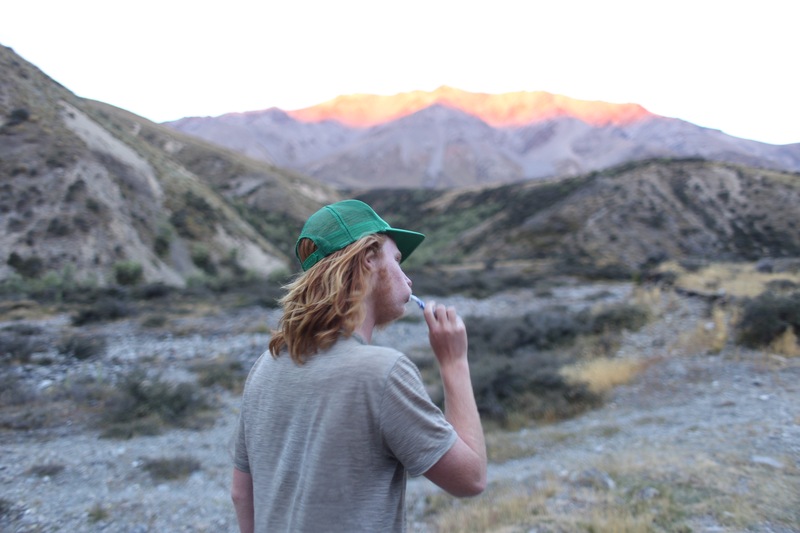 The vegetation was the most desert-like yet, with strictly tussock and rock, even far out on the flats, except for some gorse in river valleys – nothing over waist height. We continued up the ridge a tiny bit before starting the traverse through the scree, and as we made our way across ridges and valleys the track tried to conserve elevation as much as possible and stay pretty flat. We kept coming out on the top of ridges and seeing the trail for kilometers ahead of us – without trees the land feels bigger. 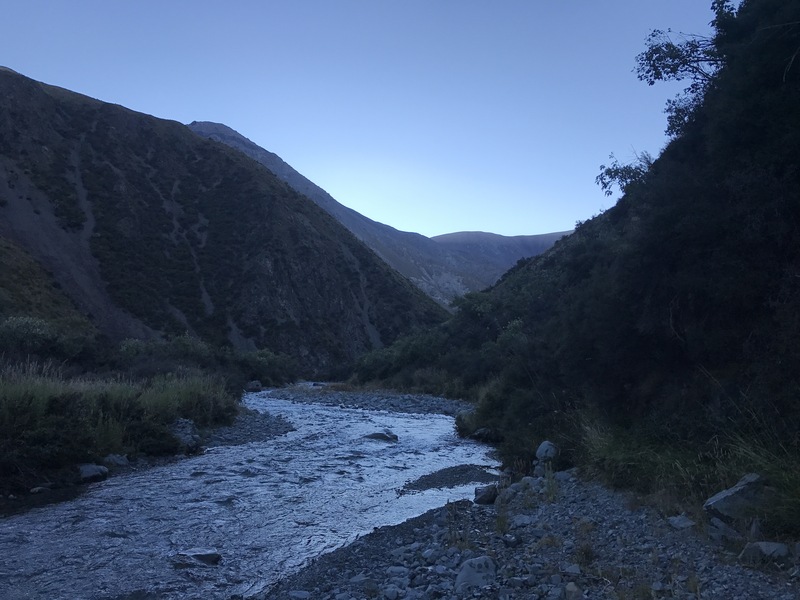 Gradually we made our way mostly down to our lunch spot, on a tributary of the Swin River North Branch right before our final climb of the day, to Mellish Saddle. After a long and relaxed lunch of about an hour, in the hot sun, we found it a drag to push up this last hill but were rewarded with the most expansive and raw vista out over the desert, and the path down gradually gentler and gentler slopes. We descended this pretty quickly to the flat, through some surprisingly tall grass, almost full body height, and once we broke out onto the flat we could see out to the northwest through some openings to the glacier-clad Arrowsmith Range, where Thomas did the mountaineering section of his NOLS course. From here the walking was easy but quite tedious and hot, and is nobody’s favorite. 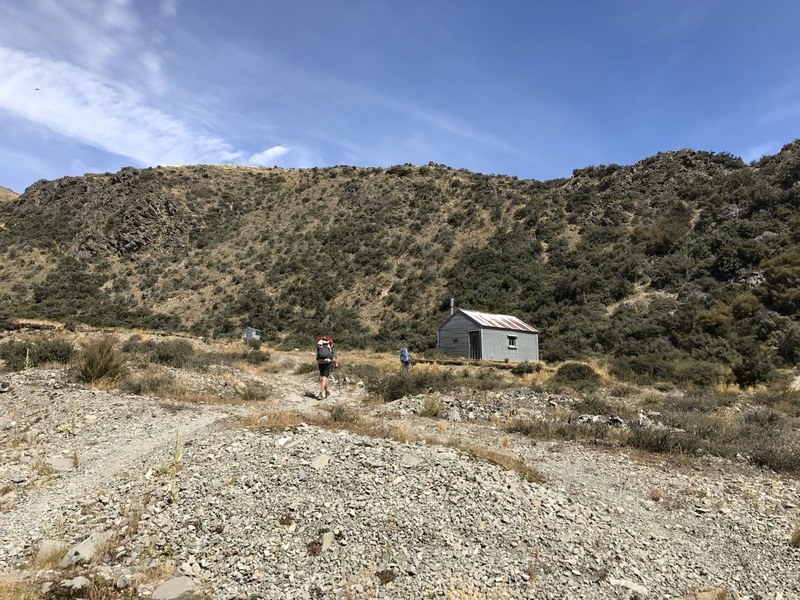 After 1.5 km on 4wd track was the junction to Double Hut, and about four and half past that was our junction to Manuka Hut. On the way we passed an older couple heading northbound, but not on the TA. By the time we reached our turnoff we were really dragging and had serious hut fever. Walking faster and faster as we got tireder and tireder probably only increased soreness. After the junction it was only 500 meters up the valley but it felt so long before we saw the hut, tucked around a corner, and when we we reached it we were surprised to find it empty! We snacked and bathed in the river right below it for a while and soon a French southbounder named Josephine, who we spent the night at Harper River campsite with, showed up. She had stayed the night at the A Frame hut last night after hitching around the river, which ended up being a 50 km day! We finished out the evening with the classic one-pot spaghetti meal and some cards and reading, and of course some lively conversation with friends old and new. We are crashing fairly early now before a long hot flat day tomorrow, which might bring some bad weather according to a forecast we got back in Hamilton Hut some days ago. We’ll leave pretty early in the morning to crush some distance both before it gets hot and before it might start raining. Nobody else has shown up and Josephine is tenting outside so tonight is the first night for a long time that we’ve gotten a hut all to ourselves!